One of the platinum print's foremost champions today is Kenro Izu. Born in Osaka in 1949, he traveled to the U.S. in 1972 and ended up living there. A wanderer at heart, he has devoted much of his career to photographing sacred places around the world. Eternal Light, Izu's current solo show at K*MoPA, is a revelatory marriage of content and technique, with exquisite examples of his work in both platinum-palladium and gelatin silver. Izu has been visiting India for several decades, lugging his camera of choice -- a massive 14" x 20" Deardorff -- to holy spots throughout the subcontinent. 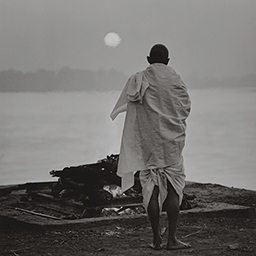 Between 2006 and 2013 he produced an epic platinum-palladium series, India, Where Prayer Echoes. For the past three years he has focused on the lives of people in holy cities along the Ganges and Yamuna rivers. The resulting series,Eternal Light, is a moving example of technical mastery placed in the service of profound and often unsettling subject matter. Izu films cremations on the ghats at Varanasi; families tending to dying loved ones in a "House of Liberation" that provides free lodging for that purpose; widows living a cloistered life in Vrindavan, a center of Krishna worship, after being cast out of their homes when their husbands died; and young children, overwhelmingly girls, in a Varanasi orphanage. These are images of death and deprivation, yet they brim with life. Eyes, skin, water, flames -- all emit a sublime luminosity in Izu's hands. The current show includes works from India, Where Prayer Echoes as well asEternal Light. The former, while stunningly beautiful, have a cooler documentary feel to them, whereas the latter -- perhaps because they were shot in closer proximity to their subjects -- seem warmer and more intimate. The physical constraints of shooting indoors in such places as the House of Liberation prevented Izu from using his big Deardorff; consequently he shot Eternal Lightwith a medium-format camera and printed on gelatin silver instead of his trademark platinum. I certainly can't tell the difference. All of Izu's images are so rich that one forgets they are monochrome; if anything their subtle shades of gray are more evocative than color photography could ever be. After some time immersed in Izu's intense scrutiny of lives lived in the face of death, the museum's terrace provides a welcome respite. Here you can submit to the gentle caress of breezes blowing down through the Kiyosato woods from Mt. Yatsugatake. No moment could be more life-affirming.